What are the secrets of Chinese green tea harvesting? What separates the highest grade from the rest? Among the six types of Chinese tea, green tea is the least processed. Because of this, its quality is heavily dependent on the quality of tea leaves picked. Traditionally, high grade Chinese green tea is harvested early spring before 5 April, or Qingmingjie. These teas are known as Mingqian or Pre-Ming. However, this date 5 April should be only taken as a general guideline. The start of season varies with geography. It varies from February in Southern China to April in more Northern China. Tea grade makes huge difference to price and quality. An early Pre-Ming can cost several times more than a late pick even from the same tea garden. 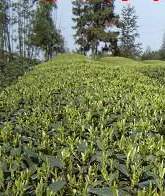 Standard practice of green tea harvesting is to start picking when 5% of the garden is ready. This happens when the tea buds reach certain size. Highly labour intensive, the best tea gardens are picked daily or every 2 days. These high grades are available only in small quantities. They are handpicked and handroasted in the same day. High grade tea leaves are young, tender, fat and consistent. Consistency leads to a clean look. Each tea shoot is complete and unbroken, free from old leaves, fruits and fragments. One bud with two slightly opened adjacent leaves. These tea shoots are pointed rather than rounded. They are essentially buds, not leaves. Even if you brew them, the leaves do not open up. The exact criterion varies with the type of gourmet tea. It doesn't necessarily mean single bud is better than one-bud-one-leaf. White tea such as Silver Needle (Yingzhen Baihao) is made from single buds. Green tea such as Longjing tea is never made from single buds. Zhejiang Longjing is one bud one leaf. West Lake (Xihu) Longjing is one-bud-two-leaves. And the West Lake varieties is more highly prized than the Zhejiang varieties. 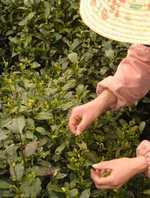 Some teas, such as the Biluochun tea, are graded according to the bud size. The smaller the bud, the higher the grade. Oolong tea is picked using half-matured leaves. An Anxi Iron Tieguanyin oolong tea is made from one bud with 2 to 4 leaves. Green tea harvesting is hard work; a deft hand is needed. Young tea shoots are very tender. They mustn't be bruised or pressured during harvesting. A standard pick is about 1.5 to 3.5 centimeters. One kilogram of gourmet green tea may contain 100,000 or more tea shoots. It may take a good picker half a day to harvest them. A rule of thumb is that 4 parts of fresh leaves make 1 part of dried leaf. All high grade Chinese tea is still handpicked today. Machines exist only for lower grade teas. These tea shoots are just too tender to be machine cropped. Xu Zhen Bing (1996). Zhongguo Mingyoucha. Jingdun Chubanshe. Oolong tea processing has long been the a dark art of the Chinese tea masters.